I've been looking into various configuration management/automated deployment tools lately. At OpenX we used slack, but I wanted something with a bit more functionality than that (although I'm not badmouthing slack by any means -- it can definitely be bent to your will to do pretty much whatever you need in terms of automating your deployments). The second type I call 'push', which means that you send configurations and commands to a list of servers from a centralized location -- Fabric is in this category. I think this is a more appropriate mode for application-specific deployments, where you might want to deploy first to a subset of servers, then push it to all servers. So, as a rule of thumb, I think it makes sense to use a tool like Puppet for the initial configuration of the OS and of the packages required by your application (things like MySQL, Apache, Tomcat, Tornado, Nginx, or whatever your application relies on). When it comes time to deploy your application, I think a tool like Fabric is more appropriate, since it gives you more immediate and finer-grained control over what you want to do. In a comment on one of my posts, Damon Edwards from ControlTier calls Fabric a "command dispatching tool", as opposed to Puppet, which he calls a "configuration management tool". I think this relates to the 2 types of tools I described above, where you 'push' or 'dispatch' commands with Fabric, and you 'pull' configurations and actions with Puppet. What we are proposing is an outline of an open source toolchain for fully automated provisioning. What's the criteria for "fully automated provisioning"? I found it interesting that you would directly compare a command dispatching tool like Fabric to a configuration management tool like Puppet. 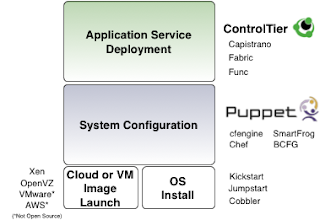 The whitepaper is written about a specific ControlTier and Puppet implementation but the toolchain and the general concepts hold for tools like Chef, Fabric, Cobbler, Capistrano, etc. Damon -- I guess my intention wasn't clear. I didn't mean to compare Fabric to Puppet as an apples-to-apples comparison. I was merely wishing that a Puppet-like configuration management tool existed in Python. I know about bcfg2, I haven't played with it though. Thanks for the pointer to your white paper. Ah got it. You know, that does touch on an excellent subject... when you build a toolchain of management tools, what kind of overhead are you adding because of differing languages or configuration methods? It begs the question, is it easier to bend (or some would say abuse) one tool to do most of everything that you want or should use a toolchain that lets each tool do what its supposed to be good at? I'm new to Puppet and while I've been using *nix systems for many years, I've never worked as a sysadmin or in ops. I'm currently writing Puppet manifests for hosting a set of (PHP/MySQL/MongoDB, code in git) web applications. Clearly Puppet needs to have some knowledge of the actual applications because I'll set up a virtual host for each one, but I'm not sure whether Puppet should be managing things like code deployment and database creation. Is Puppet an appropriate tool for application deployment? If not, can you recommend a more appropriate tool? I'd look into either Capistrano or Fabric for deployments..
You'll have better control over how the deployment happens with these two tools. Puppet is used for deployments in many large organizations, but it's not always perfect. Much of it depends on your deployment methodology. Are you deploying to lots of machines at once? Do you do rolling deployments? Some organizations use Puppet by building packages of their deployments and then having puppet enforce policy to be at the right version of that package. Because puppet has the concept of environments included, you can use environments to do deployments in stages (dev, test, prod for example). Other organizations use puppet to orchestrate deployment by either firing off an rsync, git checkout or some recursively file copies using puppet (though that is rather slow). There are other pretty good tools available for deployment too. I have used Whiskey Disk in the past (a simple ruby tool) and liked it a lot.